Will the Pretty Little Liars ever stop lying? Pretty Little Liars Season 6 Episode 12 found the girls turning their attention to one of their own as the they looked for answers about Charlotte's death. Will these girls ever stop lying? Rachel: You’d think after all the things the girls have been through they’d learn what’s done in the dark will eventually come to light. 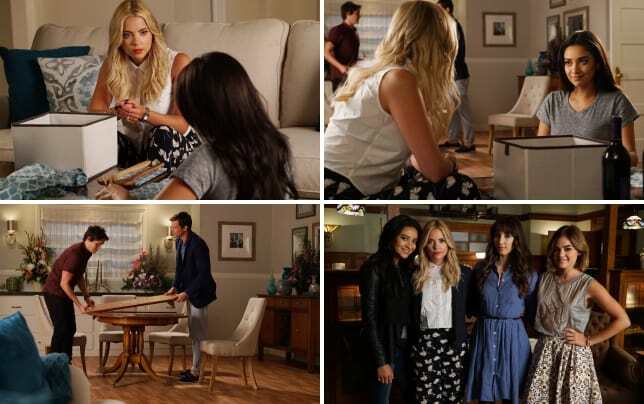 It’s seems like all of the girls, except Hanna are hiding some deep dark secrets. I honestly don’t see these girls ever stop lying; it’s in their blood. Jay: You'd think over five years they'd have learned that lying is no good, but all of them, except for Hanna, are shadier than ever. Aria, especially. I'm surprised that Hanna was the one intent on the truth being told. Spencer, you keep disappointing me. Meaghan: Not a chance. These girls can't seem to get it through their heads that nothing stays secret forever in Rosewood. I understand the initial instinct to protect Aria, that is their best friend, their family. These girls protect each other above everyone else. However, once it came to light that Ezra is the one needing protecting they should have gone to the police. Ezra betrayed all the girls' trust in the past. They owe him nothing. Paul: I honestly doubt it at this stage. It comes as second nature to them and not even Charlotte's reign of terror was enough to do it, so probably not. Talk about Alison going to Lorenzo at the end of the episode. Rachel: Alison, you begged the girls to come back to Rosewood on your behalf to get Charlotte released. They lied to the judge, after you convinced them to do so, and now you’re pointing the finger at them since Charlotte was murdered. I think Alison really wants a sense of normalcy, but she’s a DiLaurentis, nothing was ever normal about that crazy family. Alison has to blame someone for ruining her one chance at potentially having a family, so she’s blaming her friends. Jay: I think Alison just wants someone to blame. She's lost every single person in her family, in one way or another. The first Jason was recast, her mother was murdered, the second Jason thought Charlotte should continue to be hospitalized (rightfully so, I mean, how can you knowingly date your brother?) and her father seems to have finally gone down to his throne in hell, where he belongs. Alison just wants a family and every attempt has been ripped away from her. Meaghan: It says a lot about what Ali thinks of the girls. They have done so much for her in the past and gone through so much because of her. I mean hello, her psycho sister stalked them and tried to kill them and they still were willing to help Ali get her out. She needs to give them the benefit of the doubt. They may be liars but they aren't murderers. Paul: Alison has an absolute nerve to call herself a friend to these girls. She dragged them back to town to lie for her one last time. If anybody started this chain of events, it's her. What did you think of Jordan & Liam? Rachel: Hanna seems really happy with Jordan, but deep down she still misses the love she had with Caleb. You can tell Hanna still has feelings for Caleb when he asked about the table he made for her years ago. I really want Aria and Liam to work, but it seems like the writers always find a way to make Ezria happen. Every time Aria has a potential new love interest, Ezra is always in the back of Aria’s mind. She just can’t let Ezra go. Jay: I really liked Jordan. I've never been a fan of Haleb, so it's exciting to see Hanna with someone else, and she seems to truly be happy. For however long that lasts. However, the writers didn't even bother to get rid of Ezria before introducing Liam, so his character is just a joke that Aria is only able date men she isn't supposed to. Meaghan: Is it bad that I have no desire to get to know these guys? They both seem nice enough, and Aria and Hanna seem to genuinely like them, but are they really going to end up together? Chances are no. The only purpose they serve are as obstacles for Haleb's and Ezria's endgames. Paul: Jordan was annoying, but Liam actually seemed pretty nice and I'd like to see more of his story. Were the girls right to confront Aria for lying? Rachel: Yes. It seems like the girls are going back down the same road when they were teenagers. They should know that small lies will eventually turn into big lies. Now that there’s another murder in Rosewood and once again, the girls are the prime suspects, they have to be smarter about their whereabouts and their ability to tell the truth. Jay: After all these years, yes. These girls should know not to keep secrets from one another. It leads to no good, and lying only gets you a headstone in Rosewood. Meaghan: Yes. Lying to the police is one thing but nothing good ever comes from lying to each other. The liars' enemies always have used these lies to try to tear the girls apart. Plus Aria should have known the girls would protect her. She needs them in order to keep herself out of jail at this point. Paul: Absolutely. I can't fathom why she'd want to lie to her close friends. On a scale of 1-10, how creepy was Sara in the cemetery?! Rachel: I’d give it a 6. I'm having a hard time believing Sara is a true threat to the girls. Jay: A weak 7. I might've stifled a laugh, because Emily looked so genuinely scared when she saw Sara. Meaghan: I have to go with a 3. I literally laugh out loud every time Sara comes on screen at this point. I don't know if it is the acting or if this is actually the way she is supposed to be portrayed but I can't take her seriously. She is no Jenna Marshall. That girl was a true nemesis. She did far more than just use up the liars' hot water with excessive showers and be a dress up doll for A. Can we please bring her back and sentence Sara to a lifetime in her room in the dollhouse wearing the yellow tank top? Paul: 7. It was upsetting that Emily was trying to grieve her father and that waste of air time showed up. She's a terrible character, but I can't wait to find out what she's up to. 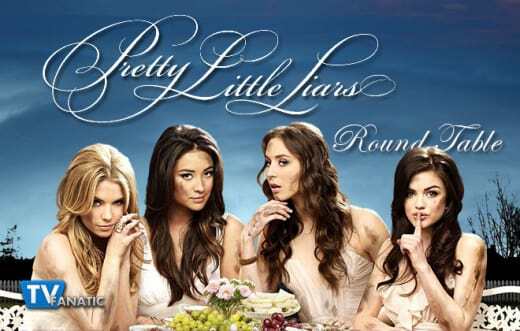 Remember you can watch Pretty Little Liars online right here on TV Fanatic. Get caught up now and look out for Pretty Little Liars Season 6 Episode 13 on 26 January on Freeform. Pretty Little Liars Photos From "Charlotte's Web"